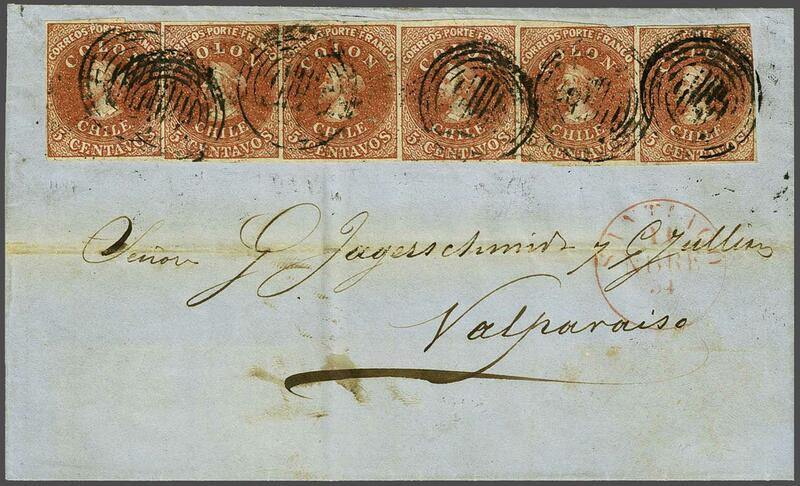 Lithographed by Henri Gillet 1854 (April-August): 5 c. pale red-brown, a horizontal strip of six, clear to mostly huge margins all round, just shaved at right and with tiny tear between fifth and sixth stamps at top, used on 1854 cover from Santiago to Valparaiso at 1½ ounce rate, tied by target handstamps in black. SANTIAGO cds of despatch in red below (Nov 14). Slightest of file folds does not detract from appearance of an exceptionally rare and attractive franking. Cert. Corinphila (1996).rnProvenance: Collection R.A.G. Lea, RL, June 1994, lot 2040; Collection 'Islander', Corinphila sale 95, Dec 1996, lot 837.